What Are Leading Indicators in Aviation SMS? 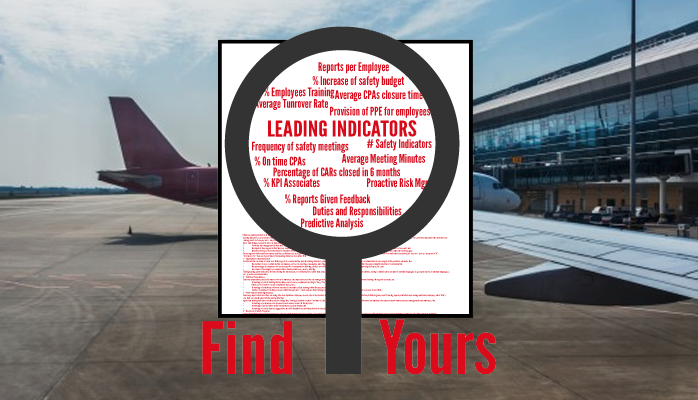 Leading indicators is a current hot topic in safety programs. I’ve noticed a that there also seems to be differing and even conflicting information about exactly what are leading indicators in aviation safety management systems (SMS). – most commonly – leading indicator examples. Identify precursors (note the plural) in that they identify “holes” (read Swiss Cheese Model) as they are lining up – they are not the “holes” (root causes) themselves: they are simply the warning signs. If it's still unclear, see here the difference between leading and lagging indicators. Every aviation SMS will have different needs, goals and objectives. Consequently, you can expect to focus on a different group of leading indicators that other operators in your industry segment. A good rule of thumb is that the best types of leading indicators are defined by a number, such as an average or percent. Poor indicators are defined by “yes/no”, such as “presence of X,” “provision of Y.” Here are 7 good tips to find leading indicators in aviation SMS. I have maintained in the past that teamwork is the most important barrier your aviation risk management program has against safety incidents. Safety programs with employees who work well together are the most resilient and most adaptable type of program. Any data regarding teamwork - especially proactive data - is absolutely indispensable to any organization. Average number (per employee) of safety issues involving problems with other employees. Low average length of employment at the same company. How much of the budget is consumed with acquiring and maintaining safety communication channels, such as training. having communication available in multiple languages (e.g. hazard reports in multiple languages. ), etc. Number of updates to training courses within the past year – which ensures that training courses stay current with the most relevant safety concerns in your SMS. Employees need to hear how they are doing. The more feedback employees receive, the more proactive they will be – period-end-of-story. The fact is that most SMS aren’t tracking response data between management and employees, and if that’s you then you should especially be paying attention. Percentage of safety reports/suggestions in which feedback was provided directly to the submitter. Corrective actions and preventive actions tracking system. When your SMS is managed by a multitude of data collection tools, the effort to retrieve actionable data to make sound business decision decreases markedly. The best practice here is to acquire an SMS database that facilitates data collection and report generation. This is your only sustainable option if you wish to benefit most from your SMS data. exposure to hazards' risk consequences. Being able to identify these weakness is a prime example of why leading indicators are so important. Organizational weaknesses perfectly illustrate the concept of identifying hazards and the associated risks that working together create problems before the problem happens. Percentage of jobs that have safety checklists. All of the above items bear a direct relation to situations that cause incidents. The more checklists, audits, hazard reports, etc. the less likely the organization will be exposed to hazard related consequences. Adaptability is an important area to focus on for leading indicators. Adaptability mainly represents your SMS' ability to respond to needs and safety concerns. Adaptability is a major concern for large or heavily prescriptive aviation SMS, as the bureaucracy involved in implementing change can be burdensome, and even crippling. Average number of days for new employees to submit first hazard report. While not true of every SMS, safety promotion has strong correlations with safety culture - it almost goes without saying that safety promotion is the attempt to improve safety culture. Mean frequency of safety newsletters. Does Your Aviation SMS Need Safety Culture Boost? Leading indicators offer safety management teams snapshots of your safety culture over time. These predictive analytical tools are only applicable for mature aviation SMS implementations. Safety management teams cannot evaluate trends and alter the course of the SMS until they have sufficient data to analyze. Leading indicators assist upper-level management in their decision-making processes. By "sufficient" data, there are two points I want to leave you with. Captured data elements should be broad enough to "check the pulse" of many areas of the SMS. Mature SMS implementations can generate considerable amounts of safety data. Having the ability to collect, organize, store and retrieve the data is the pain point of MOST mature aviation SMS implementations. This pain derives from inadequate planning or insufficient budgets for SMS database tools earlier in the SMS implementation. If you are starting your SMS implementation, you will want to figure out your SMS data management strategy early on. 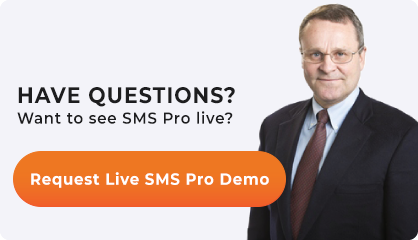 This planning prepares your safety team for future data analysis tasks that allow your SMS to benefit from the predictive risk management phase of the SMS. Do you need help? We are willing to help you succeed in your SMS goals and objectives by providing SMS database software designed specifically to manage all four SMS components. Having trouble getting started with your leading indicators? Here's a list of 40 to stimulate your thought processes! Do you need an easy way to track leading indicators or KPIs? Watch these short videos to learn how we can help you. Published September 2016. Last updated April 2019.